Maianthemum canadense (Canadian May-lily, Canada Mayflower, False Lily-of-the-valley, Twoleaved Solomonseal; syn. Maianthemum canadense var. interius Fern., Maianthemum canadense var. pubescens Gates & Ehlers, Unifolium canadense (Desf.) Greene ) is a dominant understory perennial flowering plant in the family Ruscaceae, native to the sub-boreal conifer forests in Canada and the northern United States, from Yukon and British Columbia east to Newfoundland and south to Nebraska and Pennsylvania, and also in the Appalachian Mountains to northern Georgia. It can be found growing under both evergreen and deciduous trees. It grows to 10-25 cm tall, and has 1-3 leaves, with clusters of 12-25 stary shaped, white flowers held above the leaves. 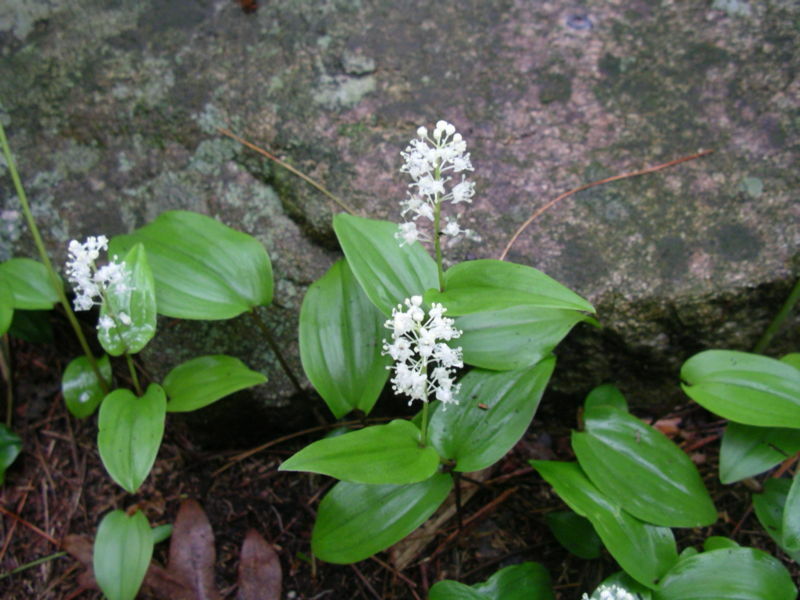 The flowers are produced from late spring to mid summer, and have 4 tepals and 4 stamens, as in the very closely related Maianthemum bifolium and Maianthemum dilatatum. The fruit is a berry containing 1-2 round seeds. The berries are mottled red in early summer and turn deep red in mid summer. Seed is produced infrequently and most plants in a location are vegetative clones, the plants spreading by their rhizomes, which are shallow, trailing and white. Leaves are slightly notched at base. They are not opressed to the stem. The plant appears in two forms, either two or three leaves growing with a fruiting stem, or a single leaf rising from the ground with no fruiting structures. Blanchan, Neltje (2002). Wild Flowers: An Aid to Knowledge of our Wild Flowers and their Insect Visitors. Project Gutenberg Literary Archive Foundation.